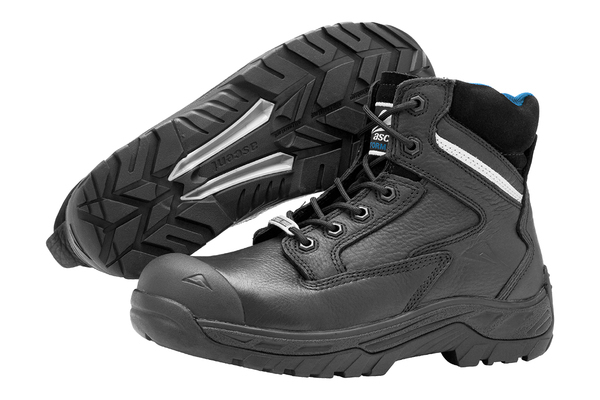 This tough work boot with its shock-absorbing slip and heat resistant outsole provides lightweight flexibility in hazardous environments. The inclusion of Tuff+ provides added durability to the midsole and Anti-Static properties ensure it is safe for use in flammable situations. Crafted with premium bovine leather upper and fully lined with Dri-Lex® for total breathability, this boot will provide the ultimate in protection for a long working day. Airport Friendly. Benefit: Static electricity finds ground through the boots. The purpose being to prevent build up of enough static electricity to cause a spark. What is it: Australian Standards 2210.3:2009 Additional Classification. Antistatic Footwear. After conditioning in a dry and wet atmosphere, the electrical resistance is above 100kΩ and less than or equal to 1000kΩ. Where is it: Through the sole and insole of the boot. 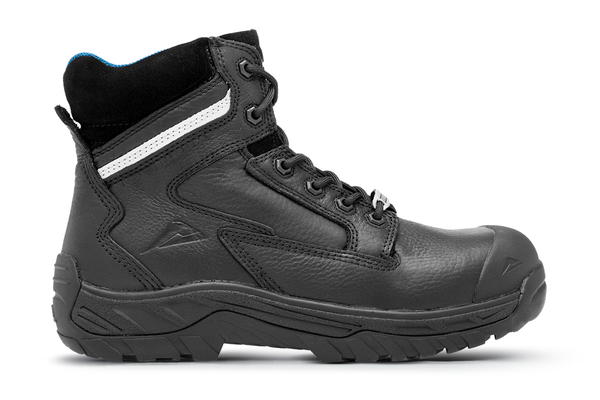 Benefit: Temperature insulation for your feet when working in cold environments. What is it: Australian Standards 2210.3:2009 Additional Classification. Insulation of Sole Against Cold. Inside of shoe is insulated against cold when put in a cold box at minus 17ºC for 30 minutes. Benefit: Superior shock absorption under the heel. See 'Cushioning' below for more details. What is it: Australian Standards 2210.3:2009 Additional Classification. Energy Absorption of Seat Region. 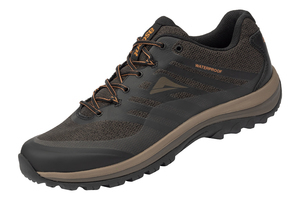 Passes the test for shock absorption under the heel. Benefit: Temperature insulation for your feet when working in hot environments. What is it: Australian Standards 2210.3:2009 Additional Classification. Insulation of Sole Against Heat. Inside of shoe is insulated against heat when put in a sandbath at approximately 150C. Benefit: Ideal for people occasionally stepping on hot surfaces/objects while working. What is it: Australian Standards 2210.3:2009 Additional Classification. Resistance to Hot Contact. Outsole does not melt, char, crack or craze when coming in contact with 300ºC surface for one minute. Benefit: Minimal water penetrates through the upper, and minimal water is absorbed by the upper itself. What is it: Australian Standards 2210.3:2009 Additional Classification. Water Penetration and Water Absorption of Upper. Minimal water penetration through the upper when tested for simulated walking in shallow water. Where is it: Upper below the level of the laces. What is it: Specially formulated foam material by PORON. Where is it: Placed directly under the insole inside the shoe in high impact areas in the forefoot and the heel. Benefit: 200 Joule impact & compression protection. Lighter than steel and provides superior insulation properties. Airport friendly. What is it: Epoxy fibreglass. Complies with all the Australian standards for Type 1 impact resistance and compression resistance (AS/NZS 2210.3:2009). Benefit: Prevents holes forming in the toe of the work boot from scuffing and exposing the safety cap. For tough work environments. 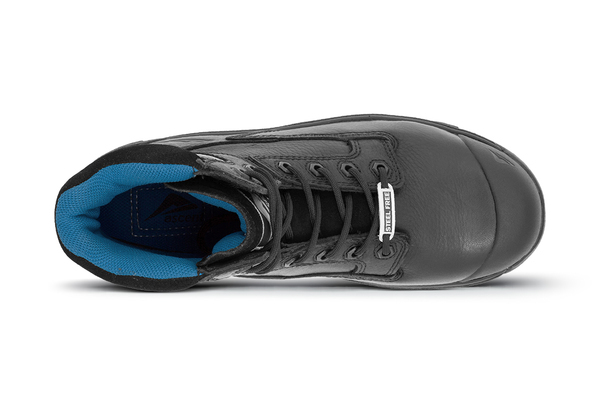 What is it: Moulded thermoplastic urethane cap over the top of the leather upper. Where is it: Over the toe area of the upper of the boot. What is it: Abrasion resistant layer on the surface of synthetic leather. Where is it: Around the front of the upper. Static electricity finds ground through the boots. The purpose being to prevent build up of enough static electricity to cause a spark. 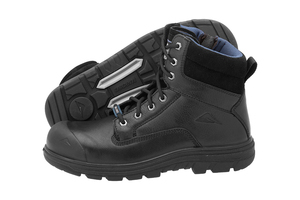 Temperature insulation for your feet when working in cold environments. Superior shock absorption under the heel. See 'Cushioning' below for more details. Temperature insulation for your feet when working in hot environments. 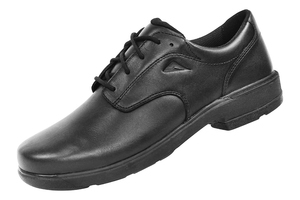 Ideal for people occasionally stepping on hot surfaces/objects while working. Minimal water penetrates through the upper, and minimal water is absorbed by the upper itself. 200 Joule impact & compression protection. Lighter than steel and provides superior insulation properties. Airport friendly. Prevents holes forming in the toe of the work boot from scuffing and exposing the safety cap. For tough work environments.